The key image in Part 5 of the revived Twin Peaks is of a woman in ecstasy. Recall, however, the subtitle that series co-creator/director David Lynch appended to his thorny 2006 masterpiece Inland Empire: "A Woman in Trouble." The line separating rapture and anguish is a blurry one, especially for Lynch's ladies, who are as likely to end up exquisitely chiseled corpses (the ubiquitous Laura Palmer; Part 2's doomed henchwoman Darya) as they are world-weary survivors. It's funny to think about how just two weeks ago, a mainline dose of co-creator/director David Lynch's most abstract and brutal work in years made the goofball charms of Peaks 1.0 seem a million miles away – for three or so episodes, anyway. 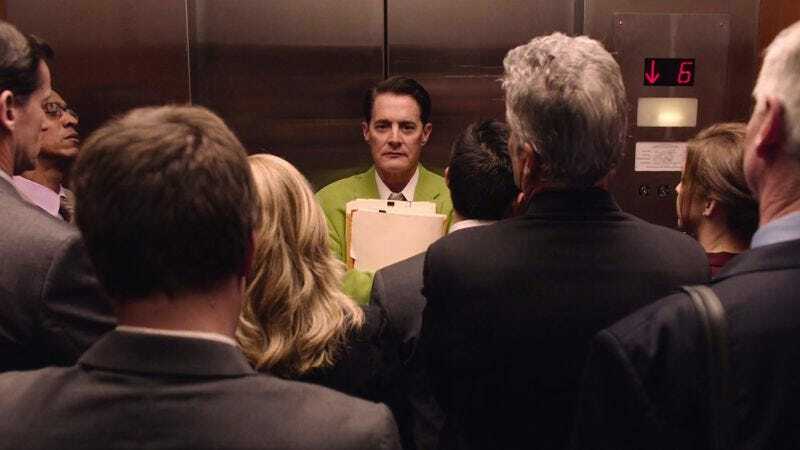 But then Dale Cooper reentered the real world in the guise of one Dougie Jones, a Vegas-area insurance agent with bad habits and worse jackets, and hilarity ensued. So now, we can spend the bulk of The Return's fifth chapter following Dale/Dougie around as he tries to figure out cars, coffee cups, elevators, statues, conference rooms, etc. – and just laugh our asses off at it. For people wanting a linear story from these long stretches of waiting, watching, and [...] driving, it must be brutally frustrating to see the atmospherics overtake the story, to see the series as a vehicle for strangeness. But the atmospherics of Twin Peaks always outranked the story—or maybe it’s more precise to say the atmospherics were the story. Twin Peaks isn’t, and never has been, a procedural adorned with transcendental flourishes. The meaning has always been in the arcane, in the inscrutable, in the transcendental. The procedural elements are just the vehicle they ride around in. They’re the flashy details that get us to hop in for a ride, not the engine driving this thing. Lynch turns the tables on us to show us why Becky would be with Steven. Lynch enjoys distantiation. Long shots, long scenes, and raw sound serve to disorient the viewer. When he uses close-ups, they carry with them greater emotional power. And so it is with Becky, when Steven charms her into laughing at a dumb pun, and the smack hits, and The Paris Sisters’ “I Love How You Love Me” comes on the radio. Lynch cuts to an overhead close-up of Becky looking up and out of Steven’s convertible, the wind blowing across her beatified visage. She grins from ear to ear. The shot is inherently beautiful, but it is also deeply unsettling. We haven’t seen many close-ups in these five episodes yet, and certainly no close-up quite like this. Lynch holds the shot for 50 seconds, so that we can drink in Becky’s glazed-over, smacked-out euphoria. He overexposes the shot, making it resemble some close-ups from Inland Empire. There is such darkness in that beauty.